Champions League 2017 and La Liga 2017. This piece could just stand there and what will going on below would seem be useless.Nevertheless there are some other very interesting facts and details about the success of Zinedine Zidane in Real Madrid. Came in 2013 in Real Madrid as Carlo Ancelotti adjoint, Zinedine Yazid Zidane became manager of Real Madrid Castilla in 2014, the reserve team of Real Madrid who plays in the third division. Failing to access the play-offs for the climb to the second division, he finally takes the lead of the first team in the month of January 2016. After bad results with Rafael Benitez and a lot of critics from public about the game played, Florentino Perez resolved to sack the spanish just after 6 month after his signature. Very appreciated by the most important players of the team, it is quite easy for Zidane to enter the most important locker room of the world, especially after the eviction of Rafael Benitez. Zidane puts in place a tactic inspired by Carlo Ancelotti, with a game that is initially more offensive and unbalanced than under Rafael Benítez and a 4-3-3 formation that turns into 4-2-3-1 on the defensive phases or in 4-4-2. He asks for a more important pressing to his team than Carlo Ancelotti, as well as a sustained activity, which results in more important races than under Rafael Benítez. Pepe illustrates this aggressiveness well in pressing and intensity, allowing to fill in breaks. It’s especially a good choice, though letting Raphael Varane on the bench, when you know how Real Madrid players are focused on the attack. He also seeks to revive James Rodriguez and Isco, not tenured in the first half of the season, but these two players disappoint him in turn. The results are irregular, but Zinedine Zidane gradually builds on a more balanced tactic with the return of Casemiro as defensive midfielder, letting Isco on the bench. From this change the brazilian, who had some trouble to find his place after his transfer, is now a major piece in Zinedine Zidane squad. Real Madrid win the Champions League against Atletico Madrid and finish the 2015-2016 season in 2nd place in the championship with 90 points, behind FC Barcelona (91) and ahead of Atletico Madrid (88), which is considered an honourable performance given the crisis in January. The next season is even better with another Champions League and this time a champion title. Tactically, Zidane regularly used a 4-4-2, with Cristiano Ronaldo moving more often beside Karim Benzema in front of the attack. 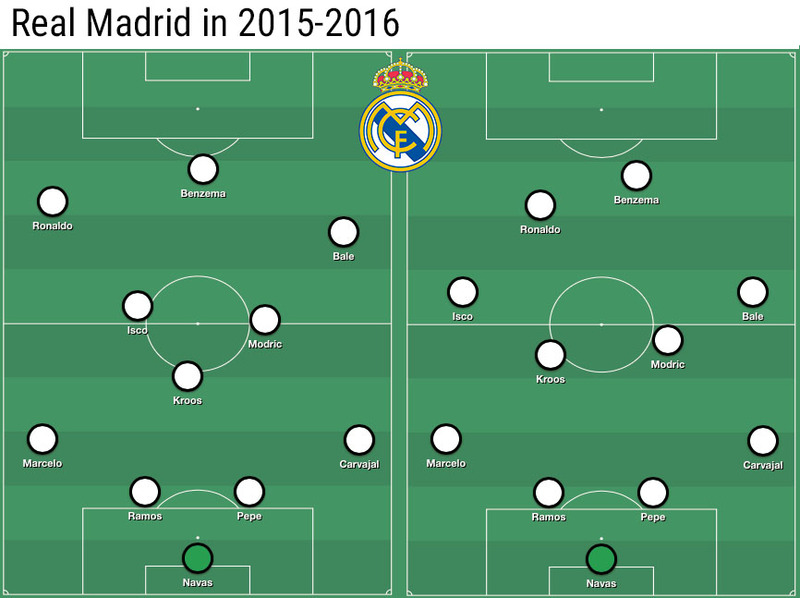 This re-positioning is a key in the success of Real Madrid, although the style of play remains difficult to define but the individual talent of its stars allied to an midfield above all competition allow to keep Real Madrid at the top all the season, breaking the Spanish unbeaten record (40 games in a row without defeat in all competitions). With James Rodriguez loan to Bayern Munich, Zidane made his choices easier in attack. He continues to believe in Isco and the Spanish confirms this risk taking, chaining very good performance, positioned sometimes behind Cristiano Ronaldo and Karim Benzema make the Real Madrid seem like a 4-3-1-2. Meanwhile, Gareth Bale loses a lot of play time, due to repeated injuries, and it would not be surprising to see a conflict happen when the Welsh will fully recover. There is a widespread belief that Zidane’s role as a manager of this Real Madrid side involves him with only managing the egos and keeping them happy. It is true that in a tactical point of view, he doesn’t create new things. He continue over Ancelotti mindset, adding more turn over into the squad to keep a good team all over the season, with few injuries and therefore able to compete in all engaged competitions. David Bettoni : He is part of the inner circle, of those who call him Yazid or Yaz. Bettoni and Zidane have been friends since their teenage years at the Cannes training centre and their lives have always been linked. Assistant, right-hand man, confidant, man of confidence since the French coach took charge of Real Madrid Castilla, in July 2014, Bettoni is essential in all the successes. While the board wanted to impose Santiago Solari on his side in the first team, the technician was intractable. And for good reason, Zidane coach would surely not quite the same without Bettoni. Hamidou Msaidie : If he does not have, with Zidane, the fusional relationship of Bettoni, Hamidou Msaidie counts a lot for the French technician in his daily work. This member of the staff, of Cormoran origin, is a kind of “Swiss army knife” of the organization and ensures the connection between the medical, the physical and the technique. Very shy, he works a lot, in the shadows. Visibly very appreciated by Real Madrid, for these fascia-therapy techniques (manual therapy that acts on all the structures of the body (bones, joints, ligaments, muscles, arteries, heart, lungs, intestines …) and in particular on the “fascias”, thin membranes that envelop and connect all these elements like a spider’s web) and even Usain Bolt, has repeatedly addressed requests, which remain, until the last news, unanswered. Antonio Pintus : When Zidane played at Turin Juventus (1996-2001), Pintus was the assistant physical trainer. When, in July 2016, he began to set up his first full season on the bench of the first team, Zidane appealed to the Italian. The latter had just signed with Lyon but the offer of Real Madrid could not be denied. It is not for nothing that the Real Madrid players suffered little injury during the season, and he is now considered as one of the best physical trainer. Javier Garcia Coll : Coordinator of the first team since the 2000s, he is one of his best friends. If in addition we add experienced players like Sergio Ramos and players with whom he has a lot of affection like Karim Benzema, it is easy to see that the French coach is a very good manager, thanks to his career as superstar. Two Champions League and already some titles in Spain like La Liga and Spain Supercup in 2017, his coaching career is already full. Nevertheless it could be interesting to watch him at the head of another club, maybe a smaller one, to see more of his tactics and management skills in a unknown environment. After that, there are some voices in France that would like to see him in France national team, where has a special past as the best French players of recent decades and symbol of the French victory in 1998 World Cup. Moreover, the last French coaches are all old players: Didier Deschamps, Laurent Blanc, Raymond Domenech or Jacques Santini. We feel that the circumstances could be perfect, between the end of the contract of Didier Deschamps as coach of the France team, possibly after the Euro 2020, and a potential replacement by Zidane. However, in the current state of things, this might be a bad thing for the French team if Zinedine Zidane can not change his tactical sense. Currently, the France team makes good performance (final of the last European Cup) but Didier Deschamps can not implant a style of play, taking no risk both tactically and in the choice of players. Zidane could be the same type of coach, very good in team management and team harmony, but struggling with tactical choices.